This Westwood hangout is one of the best known hookah joints in the city, and it's almost always busy. Although a variety of Middle Eastern and Continental food--from kabobs to pasta--is served, the star here is undoubtedly the water pipe. There are over 40 different flavors of tobacco to choose from: including apple, mint, melon and that perennial crowd pleaser, strawberry. The weekends are especially crowded, when UCLA students come to get their tobacco fix, Persian-style. 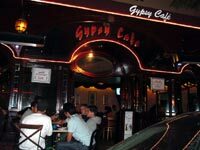 Gypsy Cafe offers 25 different flavors of Egyptian Herbs.